Join the discussion on our forums! Come discuss Direhorn Hatchling over in our dedicated Direhorn Hatchling discussion topic. Can we talk about how cute the attack sound is? Out of all the games I've played with this card, I've still yet to draw the Mama. 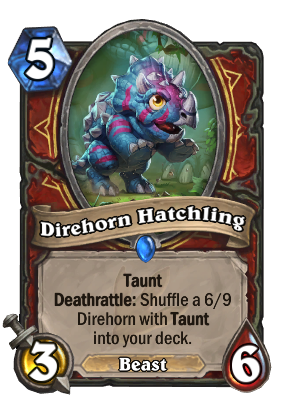 Still a very good card though, meets the criteria for Quest, Curator, and N'Zoth synergy! 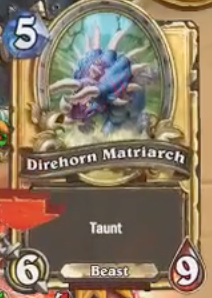 THIS CARD IS SO FRICKING A.W.E.S.O.M.E. Good stats, nice deathrattle. And sooo cuuuuteeeeeeeeeeeeeeeee!! And this little baby doesn't die!! She/he runs and hides behind his mom!!! Love that detail. 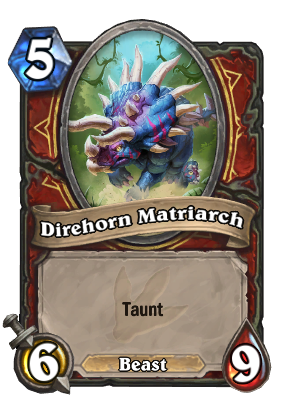 Possibly my favorite card from the expansion so far! Questing N'Zoth warrior hype ! Always amazed at people's stupidity. Any argument apart from insulting other people like a kiddo ? Well, this is a Rare, and its in a class that's historically been better at Control than Shaman. And it contributes at least once to the Warrior Quest, and twice if you draw the 6/9. No argument necessary...that's how stupid your comment was.